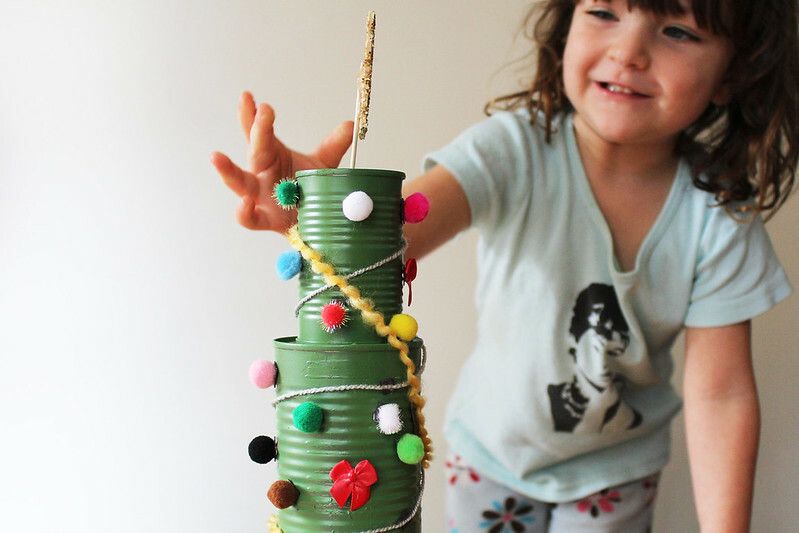 Recycled crafts are always a winner around my house and this easy Tin Can Christmas Tree Activity for kids was the perfect way to upcycle some cans and provide the kiddos with a design challenge! I have to admit this is my favorite Christmas DIY post yet. 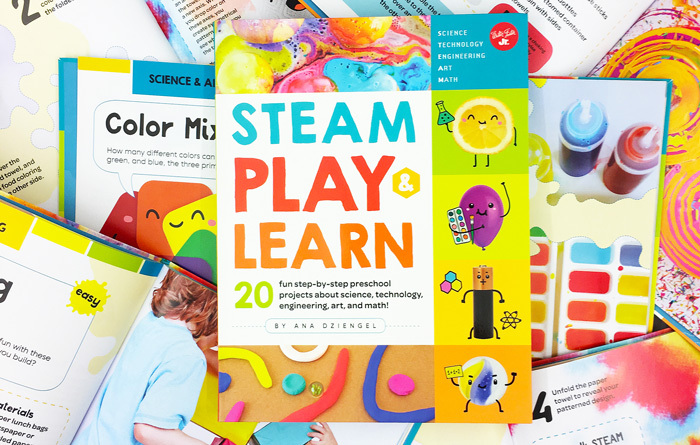 Not only did I have fun creating it but my daughter actually loved doing the activity! 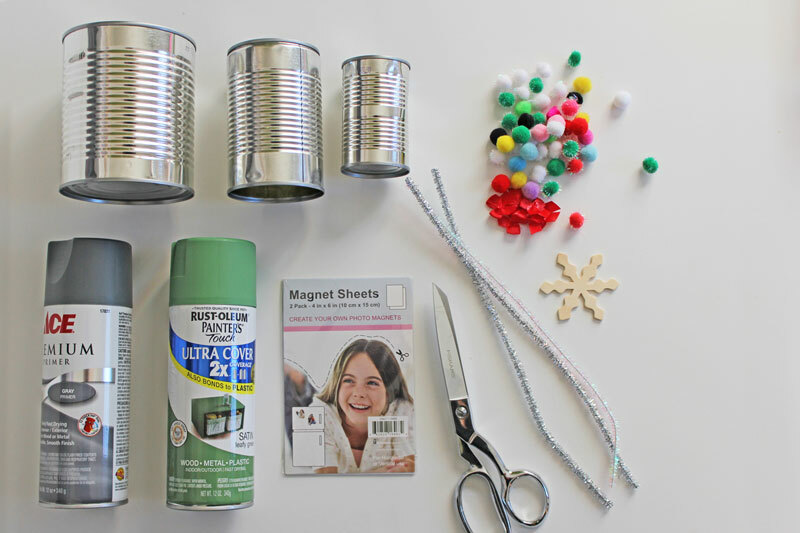 This idea was inspired by the tin can robot idea that floated around the craft circuit a few years ago, originally published in Parents Magazine I believe….only this involves a Christmas twist! The fun part about this is that tree decorations are removable/repositionable. Have the kids decorate them, take the decorations down and start all over again. This post contains affiliate links to products I love and recommend to my readers.Thank you! Step One Spray paint your cans. Start with one coat of primer and then paint with one to two coats of green paint. I used Rust-Oleum Satin Leafy Green for a softer green touch. Step Two Make a small hole in the top of the smallest can for you to insert the star. I did this last, but better to do it before gluing the cans together. Step Four Cut your magnetic sheets into pieces. Small roughly ¼” square pieces will work best for the mini decorations. Step Five Remove the paper backing from the small magnetic pieces and stick them to pom poms and yarn. For the yarn I suggest sticking a magnet every few inches so you can wrap the trees. Step Six Make a star for the top. A couple options depending on what you have on hand: bend a glittery pipe cleaner into a star shape, coat a wood star/snowflake shape with glitter and let dry. When finished glue the star onto a toothpick. Step Seven Put all the decorations and the empty “trees” on a table and let your kids have a ball decorating them! You’re done! 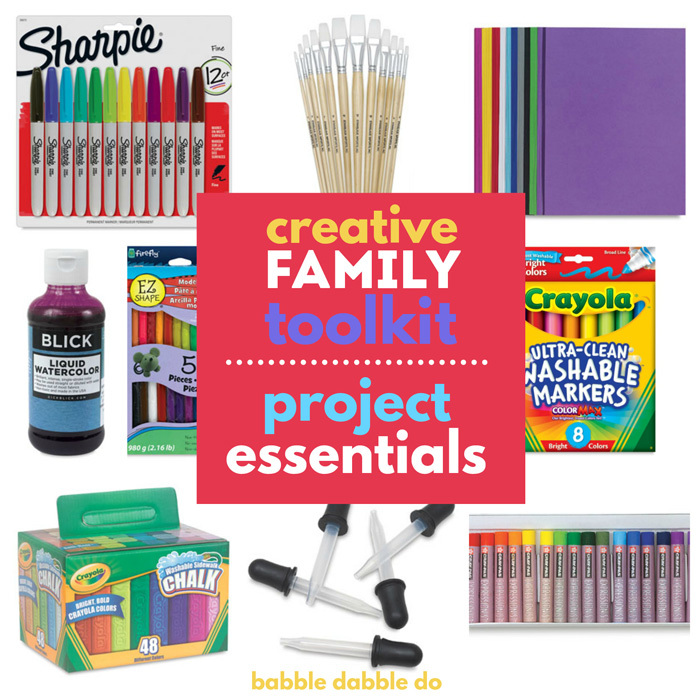 You can display these around the house or remove all the decorations and let your kids decorate them as many times as they want. Make sure to save the activity for next year! I love this! It’s definitely something we would do, too! I was so happy to have your very thoughtful comment and visit today. 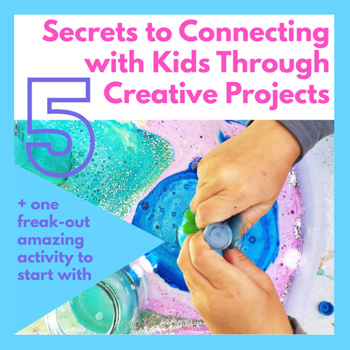 It’s such a treat to find this great blog behind it! Happy Holidays!! I can’t wait to return after the holidays! Thanks Willow! I’m thrilled you liked it. Your blog is fabulous, I’m a new subscriber! Keep up the simple and gorgeous work. 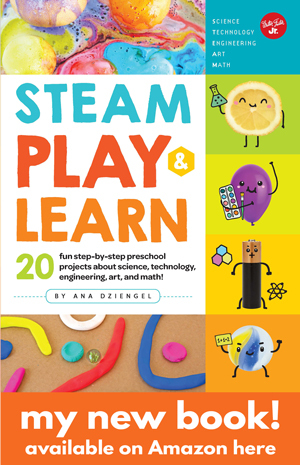 Adorable idea for kids! I definitely want to try this next year when my son is a little older! Thanks Lisa! It’s definitely fun! Thanks Aimee, that means a lot coming from you! I’m a long time fan of It’s Overflowing! Thanks Erin! Love your blog,too, you have some wonderful ideas! This is wonderful!! I’m so glad you shared it at the Preschool Christmas Party linky on Preschool Powol Packets–I’m going to feature it today on my PreschoolPowolPackets Facebook page!! I hope you and your daughter have a wonderful Christmas!! Thanks Carla!!! I’m so excited to hear you like the activity! I love your website! This is great! Super creative! I would love you to come join my Pin Me Linky Party that starts Friday morning at 8am CST. Yes…I posted this too fast…so I do realize you already know about my party. In fact, you are being featured tomorrow!! So happy to hear it Diana. Thank you!!! I loveeeee recycling projects and this looks so fun to do!!! Such a smart idea! This is such a great recycling project for the holidays and lots of fun too! I’ll be sharing on The Crafty Crow soon! THANK YOU! This is a favorite post of ours so I’m thrilled you enjoyed it. Thanks as always for featuring us! Happy Holidays!